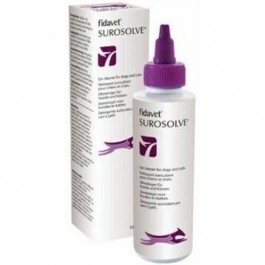 SUROSOLVE can be used for maintenance cleaning of healthy ears. Avoids the appearance of ear problems. 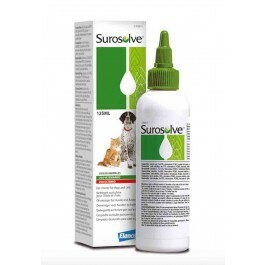 SUROSOLVE can also be used to cleanse ears that have a tendency to become dirty and develop problems, and can be used in conjunction with any topical ear medication prescribed by your vet. Helps prevent ear infections such as Malassezia. Surosolve contains Tris-EDTA which potentiates the effect of antibiotics. o EDTA is a chelating agent that destabilises bacterial membranes, causing lysis of the bacteria. o Tris reinforces the chelating action and has a buffering capacity. o PCMX, which is an antiseptic and disinfectant with antibacterial and antifungal properties. It helps to balance the microbial flora of the external ear canal. o Docusate Sodium, which is a cleaning agent and has a ceruminolytic (wax softening) action. For dirty and smelly ears, use once per day, or before medicating, as directed by your vet. If using pre-medication, let ears dry before applying the topical medicine. For regular cleaning, use once a week to prevent any wax or dirt build-up.